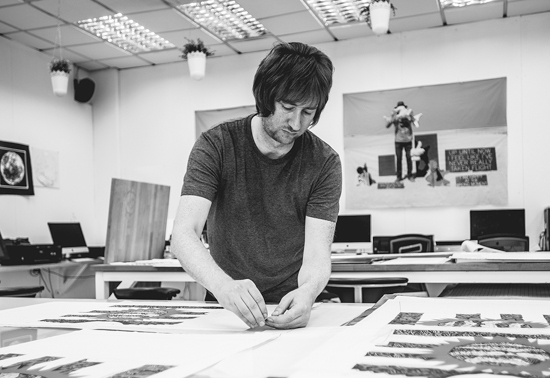 Rhys Himsworth received his BA in Fine Art from Central Saint Martins College of Art and Design in 2003, and his MA in Printmaking from the Royal College of Art in 2009. He taught as a visiting faculty member at Virginia Commonwealth University's Richmond campus, where he continues to be a regular visiting artist and lecturer. He is currently the Director of Painting + Printmaking at Virginia Commonwealth University's campus in Doha, Qatar. Here he heads up the first fine art program in the country's history and has, together with his colleagues, founded Fanoon: Center For Printmedia Research. He also oversees and coordinates the university's artist in residence program. Himsworth has been a visiting lecturer at Central Saint Martins College of Art and Design and the University of Hertfordshire in the UK, The University of Sao Paulo, Brazil and The School of The Art Institute of Chicago in the US. He has exhibited extensively in Europe, North America and the Middle East including solo shows at Reynolds Gallery in Richmond, Virginia and ‘Entropy’ in Doha, Qatar. He also took part in the biennial ‘Locws International’ in Swansea, UK, 2011 and the India Art Fair in New Delhi in 2015. Fleming Jeffries is a visual artist who explores the intertidal zone between humans and the natural world. 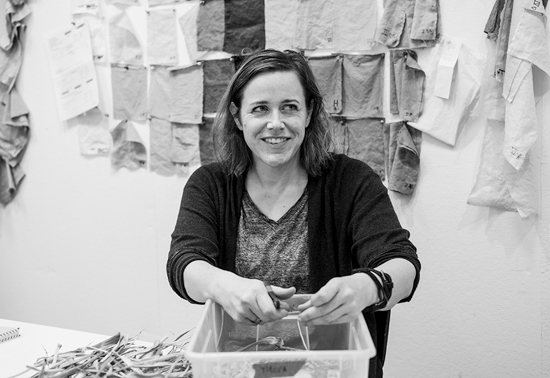 Her work relies on printmaking, paper/dye arts, installation and heavy process as a means to slow down the mind’s eye and distill metaphor. Originally from Washington DC, she is currently based in Doha, Qatar, where sharply built and un-built environments swim together in constant flux. Fleming has shown in the US and internationally with work in private and public collections, including the RISD Museum and the Corcoran Museum of Art. She has been awarded the Winter Fellowship at the Fine Art Work Center in Provincetown, Massachusetts, the Keyholder Residency at Pyramid Atlantic in Maryland and has participated in various art residencies in Iceland, Turkey and China. She completed the Printer Training Program at Tamarind Institute of Lithography in Albuquerque, New Mexico and worked on the team to rewrite The Tamarind Book of Lithography. She received an MFA in Printmaking from Rhode Island School of Design and has taught at American University, George Mason University, and, since 2013, VCUarts Qatar, where she currently is serving as Interim Director of Painting and Printmaking. 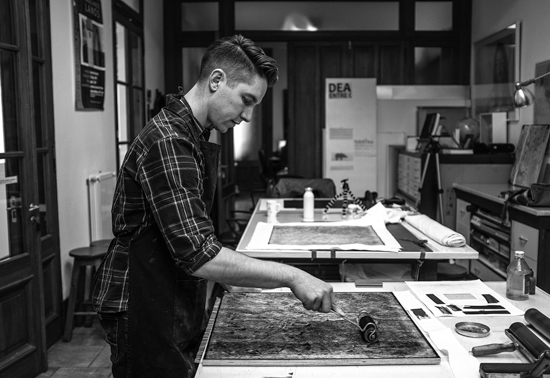 Zach Stensen holds an MFA in Printmaking and a Book Arts Certificate from the University of Iowa. His practice encompasses drawing, printmedia, and artist books, and seeks to explore the grey area that exists between personal history and self-mythology. He has shown in over 50 national and international exhibitions, including installation projects with his artist collective, The Four-Footed Fellows Correspondence Club. Zach's work is in over 20 collections including the University of Minnesota Libraries, Special Collections, and Rare Books; the University of Wisconsin-Madison, Kohler Art Library Artists’ Book Collection; and Kyoto University, Japan. Zach has been an assistant professor at Virginia Commonwealth University in Qatar since 2011 and has acted as Master Printer for all Fanoon projects since the program's inception. Emelina Soares recently graduated from Virginia Commonwealth University in Qatar with a BFA in Painting and Printmaking and a minor in Art History. She is currently pursuing an MA in Museum and Gallery Practices at University College of London Qatar campus as a part-time student, graduating in 2017. She has been the recipient of three yearly merit scholarships during her education at VCUQ. She was also granted a complete merit scholarship at UCLQ, alongside an awarded studio for a nine-month Art residency program at the Fire Station (Heritage site) in Qatar. Wajiha Pervez is an innovator, maker, traveler and storyteller creating positive impact through art & design. 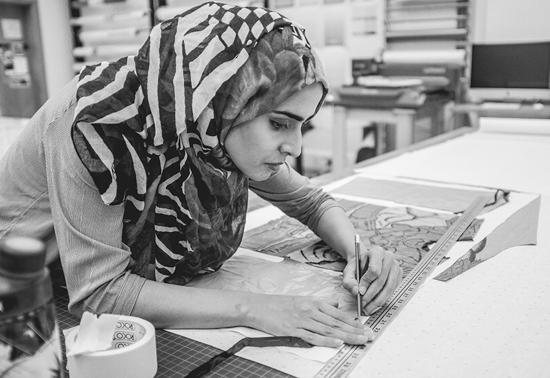 Born and brought up in Pakistan, she always had an appreciation for craft, culture, and nature which lead her to pursue her BFA in textile design with a minor in printmaking. During her BFA, she discovered her fascination for material innovation, interdisciplinary design, sustainability, and accessories, that has since been at the core of her practice. Her commitment to innovation lead her to become one of the founding faculty members of the undergraduate degree program in Jewelry Design and Gemological sciences at Pakistan Institute of Fashion & Design. She later joined VCUarts Qatar to fuel her interdisciplinary design practice and graduated with an MFA in May 2017. After graduation, she went to the Dutch Shoe & Leather Museum for intensive training in product innovation. 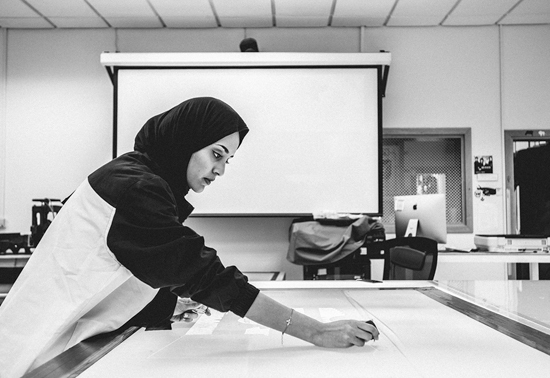 She came back to Doha to complete her residency at Doha Firestation while working as a studio assistant for Fanoon: Center for Print media research at VCUarts Qatar. Her work has been exhibited in several countries around the world including UAE, Qatar, Iran, United Kingdom, Australia, and Russia. Currently, she is the co-chair of 2019 edition of Tasmeem Doha International Art and Design conference. Elzaraa Ahmed is a recent graduate from Virginia Commonwealth University School of The Arts in Qatar with a BFA in Painting and Printmaking. 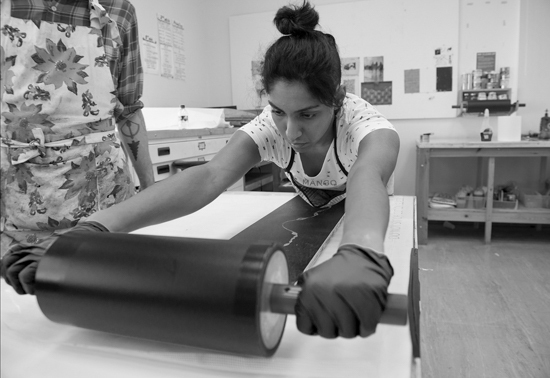 She currently works in Fanoon: Centre for Printmedia Research as a Studio Assistant. Her practice is mainly focused on mixed media paintings, analog photography and digital photography. Elzaraa is continuing her journey in arts through being exposed to multiple international art projects and is now focusing on expanding her career with photography and digital marketing. She’s worked with several fashion brands in the region in 2018 and is working on growing her own personal brand in the near future.